Homily at St.Pat’s Cathedral for Fr. Rom Murphy ‘s Pontifical Requiem, 14th May, 2014 by Fr. Len Thomas. "So why have your funeral here at St. Patrick’s Cathedral? we ask . The last word belongs to you Rom.............."
The Homily may be downloaded here. Fr Romuald ‘Rom” Murphy PE died yesterday afternoon at Catholic Homes John R Hannah Mulgrave, two days short of his eighty third birthday and in the fifty sixth year of his priesthood. 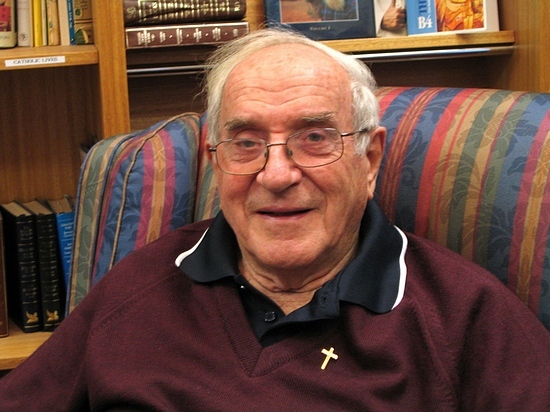 Fr Rom was born on 9 May 1931 being educated at St Mary’s Malvern East and De La Salle College Malvern. He entered Corpus Christi College in 1950 and was ordained by Archbishop Simonds on 12 December 1957........He enjoyed the chance to meet people from all walks of life and in doing so he would share freely his priesthood, his faith and kindness. As a pastor he was a kind and generous man. He wanted his priesthood to be down to earth and truly wanted to identify with the poor and to find ways of opening opportunities for people. He believed the Church should be clearly visible and present to asylum seekers and refugees hence, his service with the Jesuit Refugee Service. Across the parishes where he served he will be remembered as a kind priest, willing to speak freely and to support his people in very practical ways.....He was a great character. He was appreciative of the kindness of family and friends who shared his joys and struggles. He often told the story of his last minute hesitancy before his priestly ordination and how he learned that God’s grace was ultimately more abundantly generous than his own limitations. Fr Rom was one of the great characters of the Melbourne presbyterate whose priesthood brought blessings to so many. May he rest in peace........(more) Ed: Ivanhoe Parish was fortunate to have Fr Rom as a relieving celebrant from time to time. 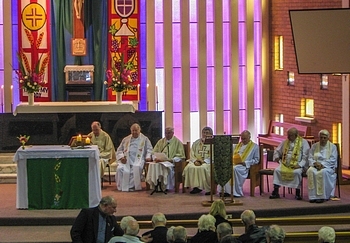 In this photo of Fr Len's retirement Mass from Ivanhoe Parish in 2010 Fr Rom is seated 2nd from the right.